With its beautiful grain and colouring, oak is synonymous with luxury and quality. 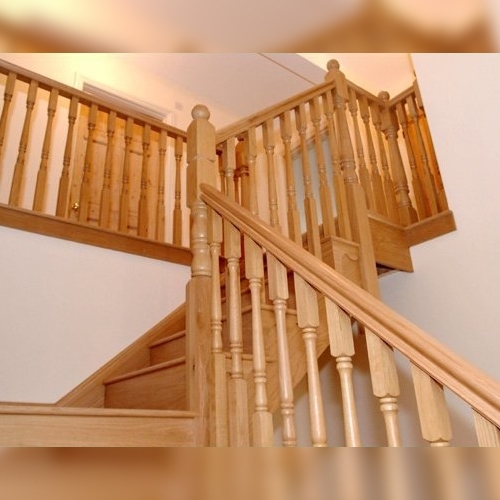 At Pear Stairs we build and supply a huge range of oak staircases and stair parts in both American white oak and European oak. We really know our timbers here, so you can be sure we can recommend the right wood for you – and we love working with oak. 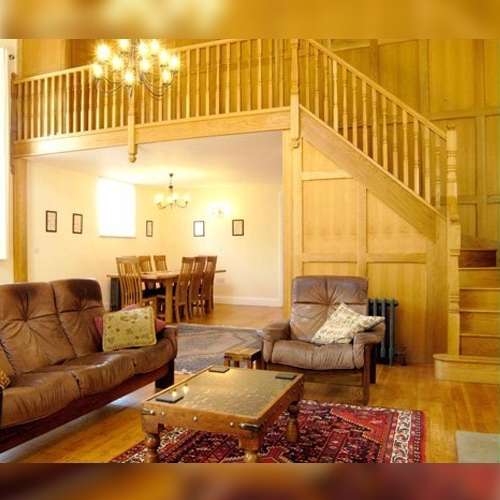 On this page we’ll take a look at some of the benefits of this beautiful timber, and the oak staircase designs our team can achieve. American white oak is a particularly attractive, durable type of timber with a subtle natural lustre, and is highly resistant to rot. Grown mainly across Eastern parts of the United States, it comes in light yellow-brown to pale biscuit tones, with an occasional pink tinge to the wood, depending on the region of origin. Because oak grows slowly it is extremely tough and heavy, with densely packed growth rings creating a fine grain that is practically water-tight. 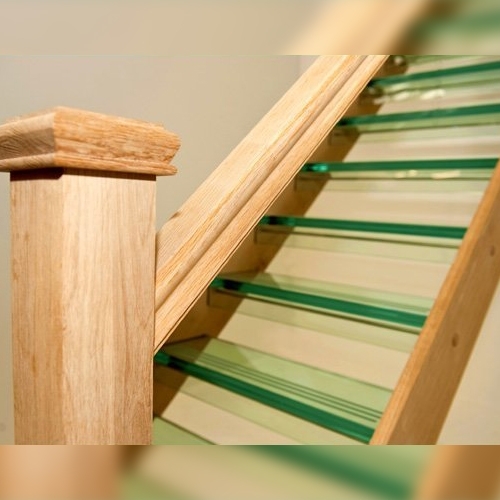 This enables the timber to withstand a lot of wear and tear, making it an ideal material for staircases. Oak takes quality wood treatments very well, polishing and staining to an excellent finish. This is necessary to seal the pores and protect the surface of the timber. With the correct finishing (we recommend Fiddes hard wax oil), American white oak provides a beautifully grained timber that will become a talking point of any home. You can also use wood stain, varnish or paint for your finish - although if you are intending to paint the stairs, you may as well choose a cheaper softwood for any components that are going to be covered up. Many of our clients prefer American white oak not just for its beauty, but its ability to be matched to flooring and skirting in similar American white oak. 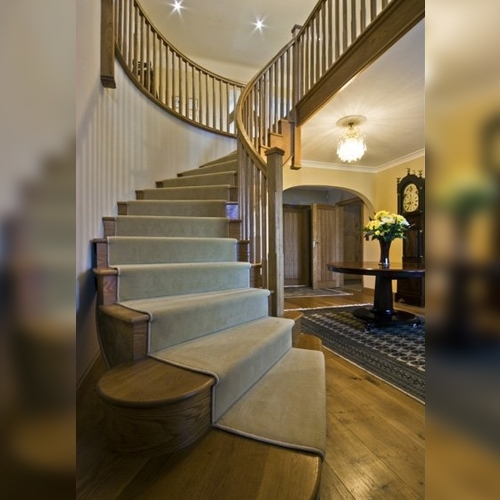 If you find that your new staircase is a slightly different shade to your existing oak doors, floor or skirting boards, you can change the colour to a certain extent by coating the staircase components in wax oil, coloured varnish or wood stain. The overall effect is stunning, as you can see from this example. European oak is also a premium, high quality timber with excellent strength and durability. It tends to be slightly darker than American white oak, with a more even colour tone. It normally comes in golden brown shades ranging from tan to biscuit, but can sometimes assume an attractive silver-grey tone on the end-grain once sawn. This type of timber usually has a fine, distinctive grain which is a little smaller than the American equivalent. It offers excellent steam-bending properties and readily accepts wax and varnish. As European oak is less widely available than American white oak, it is generally more expensive. We only use solid, high quality oak. Where necessary, we may sometimes laminate our oak parts (glue two or three quality cuts of oak together to form a whole in the required shape), but we will never use an oak veneer (a strip of outer oak surface with a softwood centre). As to quality, our joinery grade oak is generally defect free, though may contain the occasional knot. We source the oak ourselves from trusted and ethical suppliers, who manage sustainable, natural forests in northern Europe and the eastern United States. All our oak staircases are produced bespoke to your requirements. We don’t have a range of ‘standard’ sizes for you to choose from – we understand that every home has its quirks, and by using a set range of sizes, we might leave you with the problem of fitting a staircase that doesn’t exactly match your space. 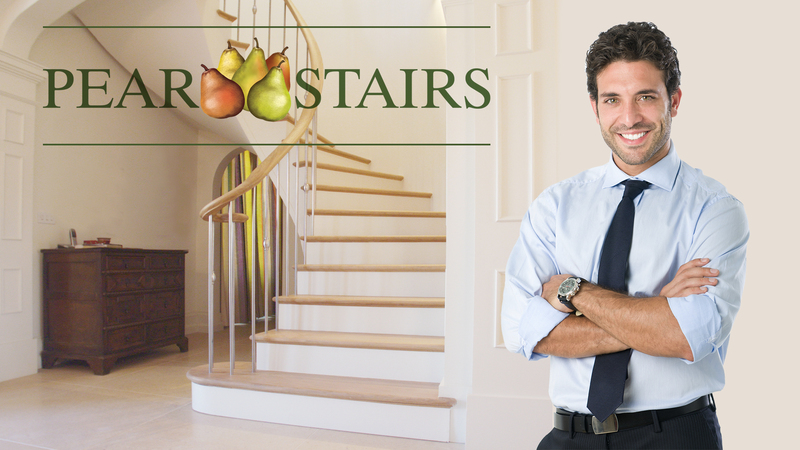 Instead, we’re committed to producing every staircase to your home’s precise measurements. All our stairs are dry-fitted in our factory prior to shipping. This ensures that all parts will fit on arrival – and any problems we identify during the dry-fit process can be rectified immediately, potentially saving hours of installation time. We price our staircases fairly. There are no unnecessary add-ons or surprise charges. If you need to rethink elements of your oak staircase design, we will never charge you more for the additional time. We are committed to fast delivery. Once we have received your initial request, our working drawings and quote will take approximately 3 days to produce. On receipt of a signed drawing, we expect delivery to take just 10 days for a standard oak staircase, or 3-4 weeks for a non-standard design. How Long Does It Take To Make A Staircase? At Pear Stairs we pride ourselves on our short lead times, literally working round the clock on a 24-hour shift system to keep up with demand. A bespoke oak staircase will normally take us around 3-4 weeks to complete after receipt of a signed drawing, although in some instances it could be delivered in as little as 10 days. We keep all the required elements for constructing oak stairs in stock, and can supply a standard finished staircase (after agreeing on working drawings) within 7-10 days. We recommend that non-ferrous fixings are used on all our oak products, as the acidic quality of oak timber can cause metals containing iron to corrode, discolouring the surrounding wood to a blue-grey tone. We advise using stainless steel fixings, wooden dowels, yellow passivated (coated steel) screws or galvanised (zinc-coated) fittings to install our staircases. We have hundreds of testimonials from happy customers, and include a of our completed oak staircases below. Take a look at our Case Studies section to see many more. This elegant modern staircase combines the beautiful grain of oak with treads made from toughened and laminated glass. The result is a striking combination of traditional timber and modern glass; these materials really complement one another. About our service, our customer said: "Very happy, exactly how we pictured it, thanks again!" A grand statement in European oak – this half landing staircases incorporates a balustrade of extra wide spindles and newels, and highly decorative artichoke caps, making the most of the beautiful timber. Our customer said: "Pear Stairs dealt with this project like the many other projects we have completed with them, friendly, professional and efficient, with no fuss and an excellent staircase delivered on time." This stunning curved staircase rising from a grand hallway is one of our favourites, and we’re very proud of it. The wooden components are made entirely of oak – including the curved D-end risers on the first and second steps. 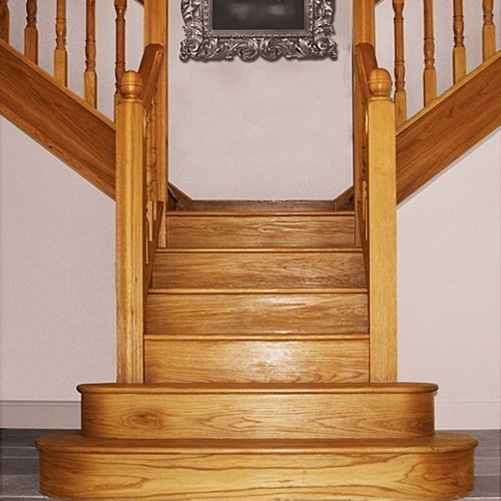 By combining a cut string profile and stop chamfered spindles and newels with the fluid curve and beautiful oak finish, this staircase achieves a balance of the traditional and modern that is truly elegant. Our customer said: "We are entirely delighted with the staircase now it has been installed, we have received many complimentary remarks from our friends. "All the staff at Pear Stairs have been great to work with, both from the initial design stage through to the installation, demonstrating a total commitment to customer care which made the process a pleasure. "The workmanship of the finished product is of an extremely high standard and we would not hesitate to recommend them to others. Our thanks to them all!" 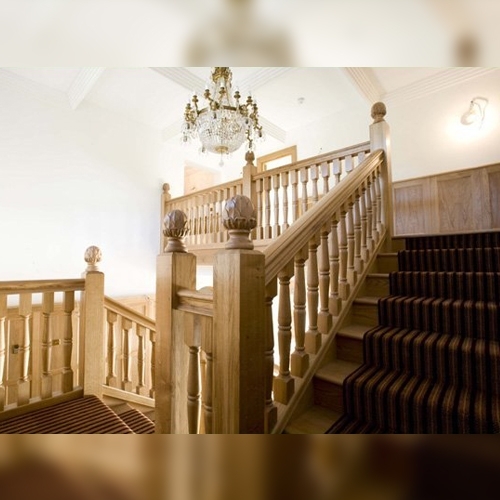 This elegant single-winder staircase design is produced in oak, and brings a period-inspired elegance to the property. The colour of the timber combined with the choice of provincial style newels and spindles perfectly matches the surroundings. 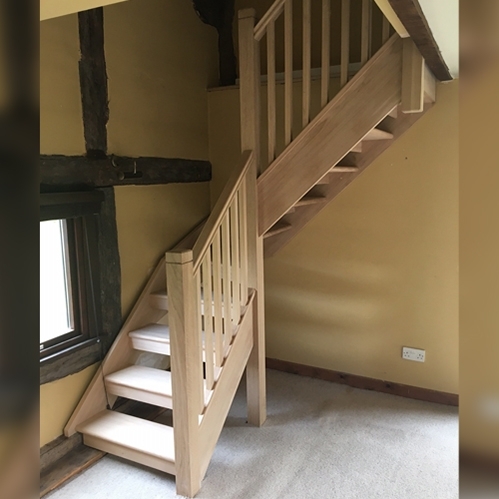 Our customer said: "My joiner was very impressed with the ease and simplicity of the installation and I had no hesitation in ordering another set of oak staircases by Pear Stairs, much cheaper than locally supplied stairs." We believe our clients deserve the tools to design the staircase they want, regardless of budget. or for more staircase design ideas, take a look at our database of over 700 case studies.